Comments Off on Accident—Negligence—Site Plan cannot be relied upon to hold that there was contributory negligence. Accident—Deceased were children—Deceased were 8 years old boy and 6 years old girl—Compensation of Rs.5 lakhs each awarded with interest @7.5% p.a. from date of filing petition. Comments Off on Accident—Deceased were children—Deceased were 8 years old boy and 6 years old girl—Compensation of Rs.5 lakhs each awarded with interest @7.5% p.a. from date of filing petition. Accident—Transportation Charges—Injured were referred to PGI Chandigarh from Karnal, for which they needed transportation and attendants at least for duration they remained admitted in PGI—Rs. 15,000/-awarded transportation charges. Comments Off on Accident—Transportation Charges—Injured were referred to PGI Chandigarh from Karnal, for which they needed transportation and attendants at least for duration they remained admitted in PGI—Rs. 15,000/-awarded transportation charges. Accident-Claim Petition-As per post mortem report, deceased suffered multiple injuries including crush injury on the head and fractures on both the ribs—Chances of deceased suffering these injuries merely on fall on the road from the motor-cycle are not possible after hitting his vehicle with a bufialo—MACT directed to assess the compensation. 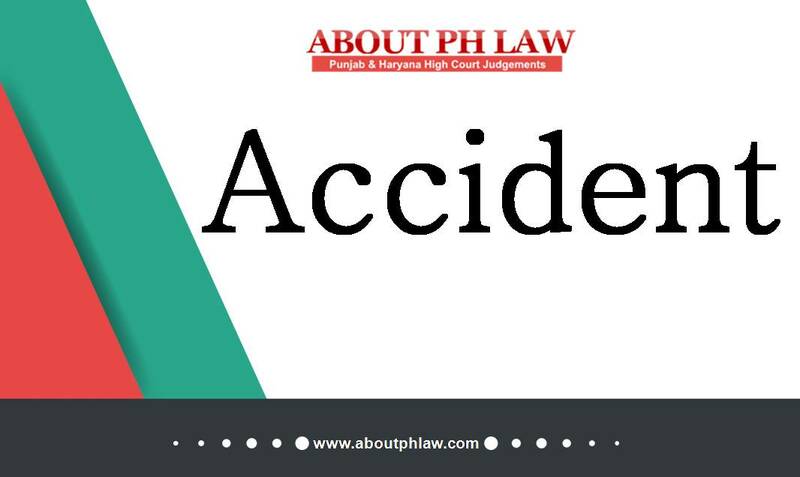 Comments Off on Accident-Claim Petition-As per post mortem report, deceased suffered multiple injuries including crush injury on the head and fractures on both the ribs—Chances of deceased suffering these injuries merely on fall on the road from the motor-cycle are not possible after hitting his vehicle with a bufialo—MACT directed to assess the compensation. Accident—Waiver of Right—Claimant had given affidavit that she does not want to prosecute criminally against driver of bus—That affidavit does not mean giving up right to pursue for civil liability as well for compensation-­Claim petition is maintainable. Comments Off on Accident—Waiver of Right—Claimant had given affidavit that she does not want to prosecute criminally against driver of bus—That affidavit does not mean giving up right to pursue for civil liability as well for compensation-­Claim petition is maintainable.